← Trailers, longtails, and iBerts, oh my! After some house and apartment hunting on Wednesday afternoon, our hungry crew (our little fam + Matthew’s mom and sister) needed a place for an early-bird dinner. Enter Local Harvest Cafe. Although I’ve been there many times, this was the first visit that necessitated a high chair. In reply to my tweet asking if they had high chairs — they do (funny how you don’t notice these things when you don’t have kids), they also said they had wooden veggies for baby entertainment. Sir enjoyed the real food far too much to need the wood version, and I don’t blame him. 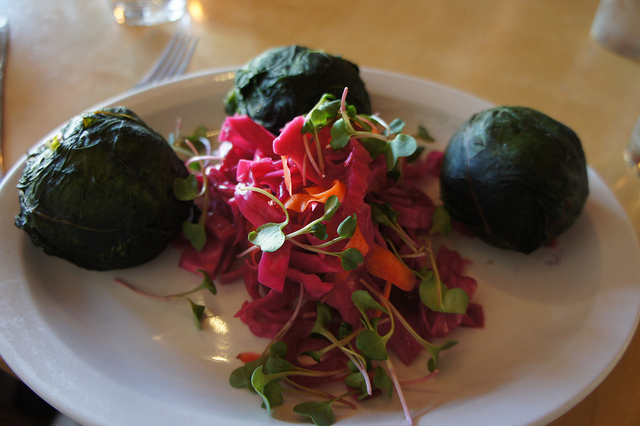 We started with some wonderful vegan meatballs made from sweet potato and eggplant, served with a chimichurri sauce. This was my favorite dish, but also the one thing we didn’t photograph. Fortunately, the rest of the meal was well-documented. 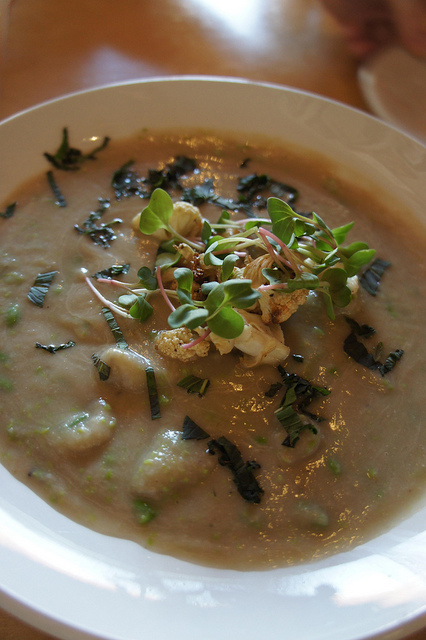 Matthew and I split the house made gnocchi in cauliflower-pea soup (above), which was that evening’s green plate special, and the chard-wrapped tamales with mushroom filling, served with a side of purple slaw (below). I love the colors on the tamale plate. 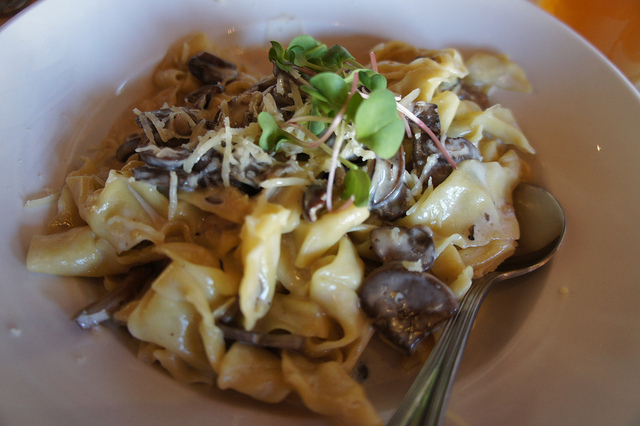 Pam and Rachel shared the wild mushroom stroganoff. Matthew tried a bite, and proclaimed it the best stroganoff ever, with lots of mushroom flavor — we plan to return soon and order this dish ourselves. Unfortunately, we didn’t get any photos of Sir enjoying the delicious offerings, but if you’re hoping for a cute baby picture, don’t despair! We started the holiday weekend early with a trip to Montelle Winery on Friday afternoon. Despite buying local wines almost exclusively since I’ve lived in St. Louis, I’ve never actually visited one of the wineries. 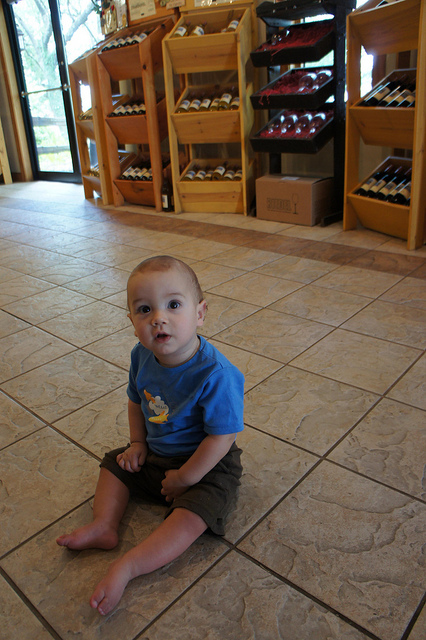 Gabriel checked things out from the floor while we tasted wines, and later enjoyed the scenic view from the large deck. While at the winery, we were in the midst of negotiating a verbal offer on a FSBO house. Between that and a fussy, refusing-to-nurse baby, it was pretty impossible to focus on the wine or relax and enjoy the beautiful scenery. I’ll admit that I was longing for some baby-free time to really enjoy the wine and setting, but I guess we’ll just have to make another trip to wine country, sooner, rather than later, I hope! All photos in the post courtesy of Gabriel’s Aunt Rachel. This entry was posted in Cuteness, Food and tagged baby, eat local, wine. Bookmark the permalink. OMG! Everything looks delicious. Must go to this place very soon! Yes, they have some great stuff on their menu right now.